Have you noticed a lot of matzo in your grocery store? Passover begins Monday night and for 8 days, bread, cakes, cookies and other foods that rise are off limits. 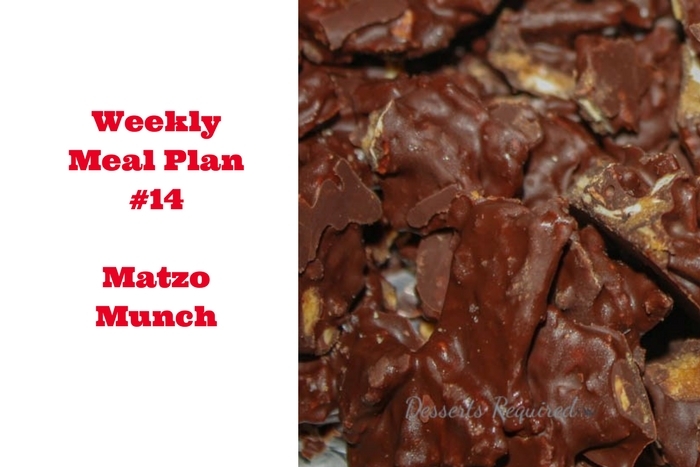 Yet I still want something decadent to nosh on which is why I am bringing Matzo Munch to Weekly Meal Plan #14. Matzo Munch is easy to put together. Basically, lay the matzo on an aluminum foil baking sheet. Pour the melted brown sugar/butter over it and bake. Once it comes out of the oven, top with chocolate chips and after the chocolate is spread, sprinkle some sea salt on top. Passover not your holiday? Great news….it doesn’t have to be for you to enjoy Matzo Munch. 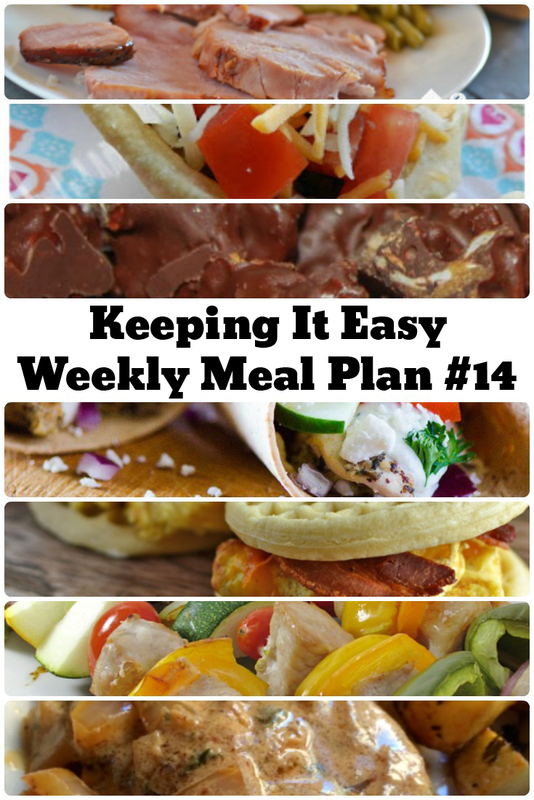 Now, let’s see what else is cooking for Weekly Meal Plan #14. Make a big stack of these Bacon & Egg Waffle Sandwiches from My Fearless Kitchen, and put them in the freezer. Pop them in the microwave for a hot breakfast every morning. Start your week off with this Honey Mustard Baked Ham from My Fearless Kitchen and you’ll have plenty of leftovers for sandwiches all week long. If you love tacos, you’ll love these Mini Taco Pies from Kimmi’s Dairyland. Anything that is small enough to fit in a kid’s hand is always a big hit! Keep your kids involved in the kitchen with these Oven Pork Kabobs from The Shirley Journey. Make a grab-and-go dinner on Thursday with these Souvlaki Chicken Wraps from The Crumby Cupcake. There is nothing like an easy recipe for a Friday night! Wrap up the week with these Simple Stovetop Pork Chops from Organized Island. Betsy from Desserts Required has you covered with dessert… you’ll be snacking on this delicious chocolatey Matzo Munch all week long! Take the weekend off, enjoy your leftovers, or eat out. We’ll be testing more recipes for you in our own kitchens!